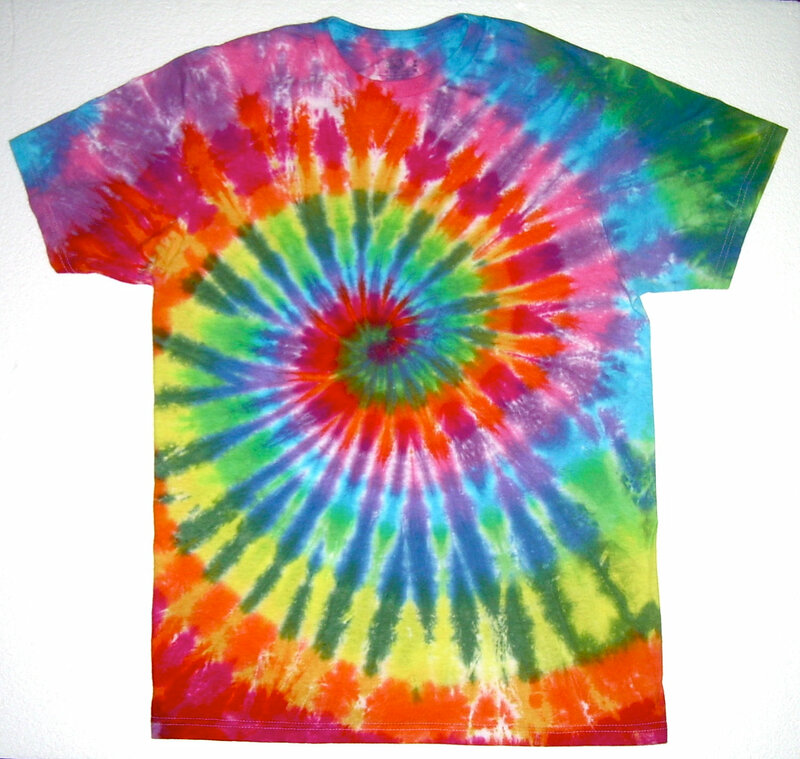 Tie dye shirts are an easy and fun project. You can make interesting and unique designs with just a few dollars’ worth of supplies and some cheap t-shirts. Be sure to pre-wash and dry t-shirt. Spread the plastic sheet (garbage bags and newspapers will do the trick!) on the area where you will be working. Read through all instructions carefully and be sure to check out the tips and precautions. 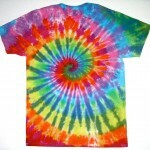 Choose one of the following tie-dye designs below and follow the instructions for creating the desired designs. Once you have tied your shirt with rubber bands, follow the directions at the bottom of this page to color your shirt. Be extra careful when dealing with dyes, and keep the chemicals away from your face. Using the rubber bands, fold your shirt into a tube (horizontal, vertical, or diagonal) and tie the rubber bands along the tube. Each rubber band will finish as a white stripe. Spread the shirt out on a flat surface. Pinch the fabric into a cone shape and insert the marble underneath the pinch, then tie it off with a rubber band. Be sure the tie is secure. Repeat this on any area of the t-shirt that you wish to finish with a circle design. For larger circles, pinch the area of the shirt and twist it, and tie it off with a rubber band. To create a circle within a circle, simply add more rubber bands along the twist. Pinch the fabric into a cone shape and tie it off with a marble inserted. Continuing along the same pinch, tie off one section about ½ inch apart from the first, one section about one finger width apart from that, and one more about two finger widths apart from the last tie. 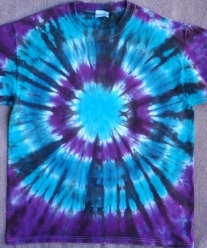 Spiral Tie Dye. 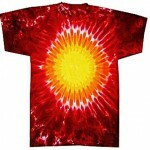 Image from tiedyebysandy.com. Pinch the middle area of the t-shirt and twist into a spiral. Keeping spiral intact, wrap the entire shirt tightly around the spiral. Use rubber bands to secure the wrap. Using the plastic bowl, prepare your tie-dye mixes according to their instructions. 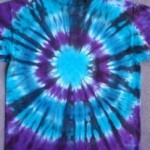 Carefully dip and dye your shirts in your desired areas and color choices. Allow the garment to soak in each in each dye for about eight hours. Using gloves, remove the shirt from the soak and snip off rubber bands using scissors. Rinse the shirt using cold water until the water is clear of dyes. Wash and dry your shirt through two full laundry cycles in hot water. For more vibrant colors, soak your shirt in soda ash before dying for a sure-to-stay dye job. Be sure to always wear gloves when working with soda ash. It’s a good strategy to dye your shirt in the evening. You will need to allow the shirt to soak for at least 8 hours in the dye. Plan to dye in the evening, so you can soak the shirt overnight.